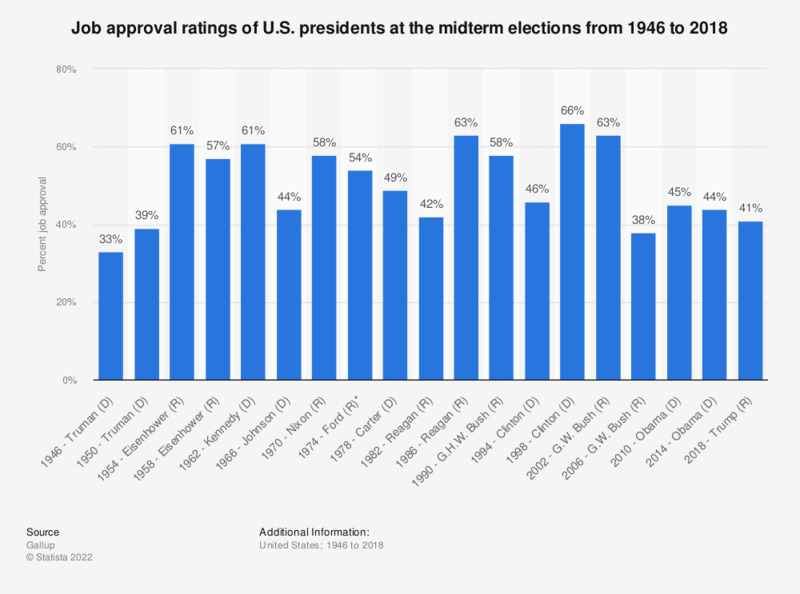 This statistic shows the job approval ratings of United States presidents at the midterm elections from 1946 to 2018. During the 1946 midterm elections, President Truman had the lowest job approval rating at 33 percent. President Clinton had the highest job approval rating at 66 percent during the 1998 midterm election. *Ford took office in August 1974, three months before the midterm elections, after the resignation of Nixon, who had a 24 percent job approval rating at the time of his resignation. D stands for Democrat and R for Republican. Data prior to President Donald Trump was found here. Everything On "United States midterm elections 2018" in One Document: Edited and Divided into Handy Chapters. Including Detailed References. How much impact do you think the results of Tuesday's midterm elections will have on American politics? How do you feel about the results of Tuesday’s midterm elections across the U.S.?